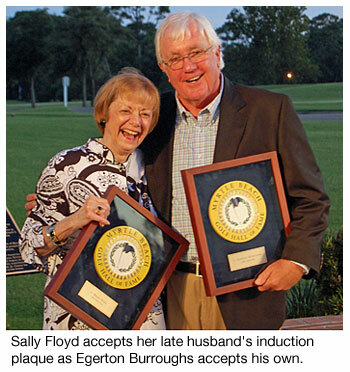 Two influential businessmen who foresaw Myrtle Beach becoming a worldwide golf destination in the 1970s and worked to develop that vision into a reality are the 2012 inductees to the Myrtle Beach Golf Hall of Fame. J. Egerton Burroughs and J. Bryan Floyd joined 10 past honorees on Aug. 26 during a dinner celebration at Pine Lakes Country Club, where the Hall of Fame is permanently established in a courtyard next to the grand clubhouse. Burroughs, 65, is best known for being chairman of the board of Burroughs & Chapin Company, Inc., from 1990-2012, but long before then he was a leader for one of the Myrtle Beach’s top management companies and helped establish the region’s first central reservation system for golf vacation packages. Burroughs led a company that came to manage some of the very best and most historically significant golf destinations in Myrtle Beach, from pioneering Pine Lakes Country Club to architect Rees Jones’ first solo designed course, Arcadian Shores, to majestic Grande Dunes. One of the lasting aspects of his legacy at the helm of Burroughs & Chapin is the hiring of architect Craig Schreiner to help restore historic Pine Lakes Country Club to its former brilliance. Opened in 1927 and formerly known as Ocean Forest Country Club, Pine Lakes was the area’s first golf course in Myrtle Beach. Today, it is on the National Register of Historic Places. Burroughs remains an active voice in the community and serves on the Board of Trustees for the University of South Carolina. Floyd was also a golf course developer. He helped develop the first 54-hole golf facility in the area and then worked for more than 30 years to market the area nationally as a year-round golf destination. He died in 2004 at the age of 68. “We are blessed to have my brother be honored by an organization like this,” said Charlie Floyd, Bryan’s younger brother by six years. “He was an inspiration to the entire family and the community. In the early 1970s, Floyd led the development of Robbers Roost Golf Course (now closed), Possum Trot Golf Course and three courses at Bay Tree Golf Plantation (now closed). He was a founder of the marketing cooperative Myrtle Beach Golf Holliday (1967) and served on its board of directors from 1986-2001. He was president of the organization from 1990-1994. Floyd lived in North Myrtle Beach from 1958 until his death in 2004. He served on the City Council for 22 years and was mayor of North Myrtle Beach from 1974-1980 He was awarded the Order of the Palmetto, the highest civilian honor in the state of South Carolina, in 2001. The Hall of Fame was formed in 2009 with the enshrinement of six charter members: Cecil Brandon Jr., Clay Brittain Jr., Carolyn Cassidy Cudone, Jimmy D’Angelo, General James Hackler Jr. and Robert White. George Bryan, Charles Byers, Paul Himmelsbach and Gary Schaal were inducted in the last two years. The Myrtle Beach Golf Hall of Fame is a partnership between National Golf Management, the Myrtle Beach Golf Course Owners Association and Myrtle Beach Golf Holiday.